Deer Park Blvd, South Omaha, Nebraska. -- PRISM was called to investigate at a beautiful home in South Omaha. The homeowner was experiencing doors opening by themselves, noises, and just really wanted to know if what was there had anything to do with the history of the house. 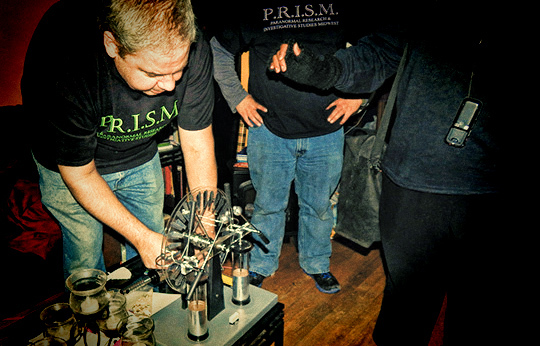 PRISM conducted a pre-investigation of the property on December 2, 2014, at which time we decided to conduct a full investigation of the property in January. Investigators present at the January 16, 2015 overnight investigation included Kelley, Bo, Jeremy, Carrie, John, Michael and Cassie. During this investigation, we used the newest addition to our equipment, with John and Carrie's Wimshurst electrostatic generator. Video from our January 16, 2015 paranormal investigation of the Deer Park Blvd, South Omaha, Nebraska residence. Our findings included an unexplained bang as well as several EVP's.